The charts and tables on this page can be used to help your children learn, memorize, and recall the multiplication facts. Lots of options - number of rows and columns, start number, show/ hide numbers, top-down/ bottom-up! 1 times to 12 times tables or combinations with up to 12 tables/ page. Unlike the multiplication chart and the tables above that that can be customized, the resources below are pre-formatted. 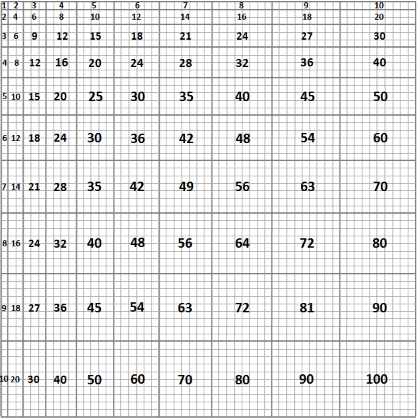 The three multiplication charts show products up to 100 and up to 144. The numbers in each chart can be hidden or displayed to allow the charts to be used as worksheets or as reference aids. The two multiplication resources below are a little different but very useful nevertheless. The multiplication chart shows boxes that are scaled according to the product within them. 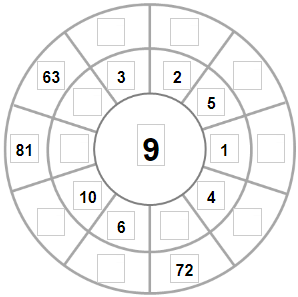 The multiplication wheel is an alternative way to show and practice basic facts. Products boxed according to size. Five alternative versions. Based on an original work by SilabuS. 1 times to 9 times table. Select the table and randomly create puzzles. Memorizing the basic multiplication facts, or times tables as they are sometimes known, is very important for your children. Unless these facts can be recalled automatically, students will struggle when learning more advanced math skills, not to mention the problems they may have conducting day-to-day transactions such as buying goods at a store. Click on the printable multiplication table or chart you want and select the Print option to send them to your printer. These resources can be used as memory aids, for reference, or for drill type practice. Note the Show Answers checkbox that can be used to hide the answers allowing these documents to be used for exercise type activity. You will find number grids, place value charts, and many other charts listed here and, if you are looking for Division Tables, you will find them here. Other popular pages in this multiplication section are the multiplication games and the multiplication worksheets pages. Sometimes there can be frustration when talking with our children. We might think that they are "tuning us out." Here are three tips that will help encourage better listening when you are tutoring your children: Get close to and make eye contact with them before speaking; Stress important words; Have your children repeat what you have told them in their own words.